Rachel is passionate about the defense of recreational facilities, youth sports programs and health clubs. She is also active in the defense of insurance companies and trucking companies. In addition, she appears in state courts throughout Connecticut representing public entities and public employees. 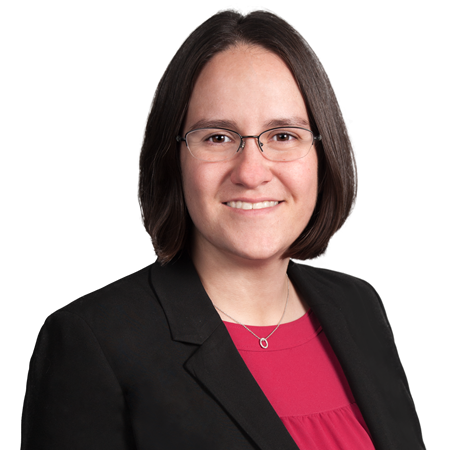 Prior to joining the firm, Rachel clerked for the judges of Hartford Superior Court. While attending law school, she was a member of the Western New England Law Review and received the CALI Excellence Award in Religion & the Constitution. Outside the office, Rachel plays softball in several local leagues. She resides in West Hartford. Ferris v. SoccerPlus Elite, Inc., et al (State Court-2017): The plaintiff, Kristen Ferris, claimed that she sustained a head injury when she slipped and fell on an icy speedbump on the Miss Porter’s School campus while leaving an event being held by Soccerplus Elite, Inc. The plaintiff brought premises liability claims against SoccerPlus Elite, Inc., SoccerPlus Elite, LLC, John Bergstrom, and Connecticut Junior Soccer Association. The plaintiff also brought claims against Miss Porter’s School in a separate action which was later consolidated with the SoccerPlus case. The defendants, SoccerPlus Elite, Inc., SoccerPlus Elite, LLC, Mr. Bergstrom, and Connecticut Junior Soccer Association, filed a motion for summary judgment arguing that they were not in possession and control of the portion of the premises where the plaintiff fell because they had only rented the inside of a gymnasium, not the entire premises. The Court granted summary judgment as to all four defendants. Madore v. ISCC, LLC, et al. (State Court-2017):The plaintiff, Steven Madore ppa Colleen Madore, claimed that he was bitten by a dog owned by a representative of a organization holding an event at the rink when he entered an enclosed counter area on the premises of ISCC, LLC. The defendant, ISCC, LLC, filed a motion for summary judgment arguing, among other things, that the incident did not occur in a common/public area of the facility. The court granted the motion. Allstate Insurance Company v. Statlander (Federal Court-2017):Allstate Insurance Company brought a declaratory judgment action seeking a declaration that there was no duty to defend or indemnify Morris Statlander in case involving a mold claim being brought against him by a tenant of a home that he owned. Allstate filed a motion for summary judgment arguing that it did not have a duty to defend or indemnify Mr. Statlander because several policy exclusions applied. The Court granted Allstate’s motion. Allstate Insurance Company v. Furnari (State Court-2017): Allstate Insurance Company brought a declaratory judgment action seeking a declaration that there was no duty to defend or indemnify Charles Furnari in a case involving a sexual assault claim being brought against him by a classmate at school. Allstate filed a motion for summary judgment arguing that it did not have a duty to defend or indemnify Mr. Furnari because there was no occurrence under the policy and policy exclusions applied. The Court granted Allstate’s motion.